The end of the world was obviously a popular theme in the films of 2013. From broad comedies ("This Is the End", "Rapture-Palooza") to summer blockbusters ("Pacific Rim", "World War Z"), it seemed like every other month brought a new interpretation of the apocalypse. 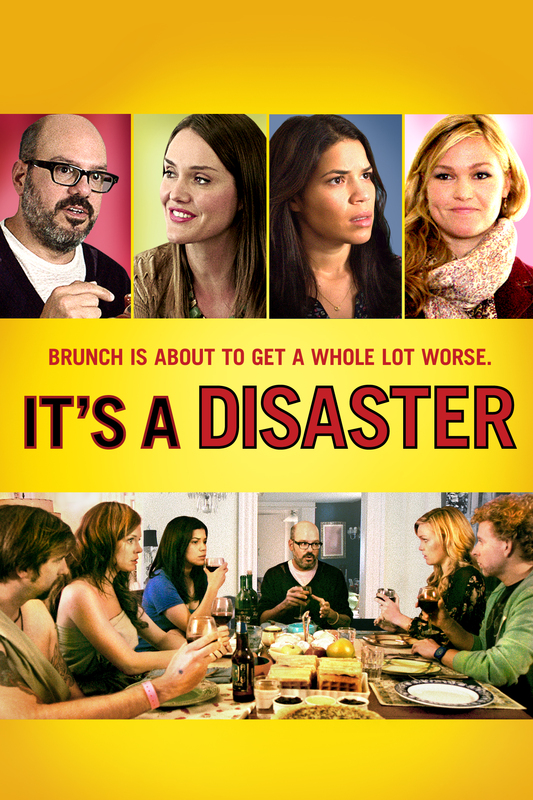 One such film that went largely unnoticed was Todd Berger's indie comedy "It's A Disaster". Released on limited screens last year, this film is perhaps the most original of all the aforementioned films. It's set in a single location as a gathering of friends assemble in suburbia for a routine brunch. As the guests arrive, the day begins much like normal with awkward introductions to a new boyfriend and complaints about that couple who is always late. It's not until the guys and girls separate for pre-brunch chit chat (about sports and relationships respectively) that things start to get worrisome. The cable, internet and phone are all shut off. Assuming that the bills weren't paid, they shrug it off until a neighbour arrives in a hazmat suit to deliver some bad news. Bombs have exploded, releasing deadly nerve gases intended to wipe out everyone in their path. To make matters worse, one of the bombs was located only a few miles from this neighbourhood. The shocking news affects each person in different ways, as each character brings their own unique concerns to the dilemma. The film largely ignores the actual apocalyptic events outside, choosing to instead focus on the expressions of character from the talented ensemble. These include such staple characters as the carefree hippie, the paranoid nerd and the stern realist among others. Triggered by their individual perspectives, they represent the full spectrum of pessimism to optimism. As expected then, some respond more rationally than others. Yet despite their eccentries, they are most notable for their normality. Whereas a similar film like "This Is The End" exaggerated its larger-than-life celebrity personas, this outing is more like a general satire of regular middle-class people. In developing this satire throughout the plot, the film displays some impressively astute writing. More importantly though, it delivers the humour. It's certainly amusing to see what matters most to these people in such a dire situation. Some reveal secrets about failed marriages, while others harbor regret about not completing their bucket list. Or better yet, some may be distraught about never watching "The Wire"! It's all played with deadpan seriousness by the actors, completely unaware of their folly. Yet even when their responses are at their most foolish, the characters remain undeniably familiar. So in a way, we're not just laughing at them, we're laughing at ourselves. Indeed, the best satires all aim for this fine balance between absurdity and truth. Thus, in making us laugh at the silliness while acknowledging the reality of their behaviour, "It's A Disaster" successfully accomplishes its intent. Most doomsday films rely on special-effects and visual cues to drive the plot. With 'It's A Disaster' however, the heightened tensions are scaled down to hone in on the essence of contemporary middle-class society. What it ultimately reveals is perceptive and often very hilarious. This may be modest low-budget filmmaking, but it delivers some major entertainment value. Shane, I'm with you on this fun comedy. It's cool to see David Cross mainly playing the straight man (for a while) among all the craziness. America Ferrera also stood out as being great fun. I'm glad you caught up with it. I'm glad I caught it too. Was pleasantly surprised, since I hadn't heard anyone talking about it.